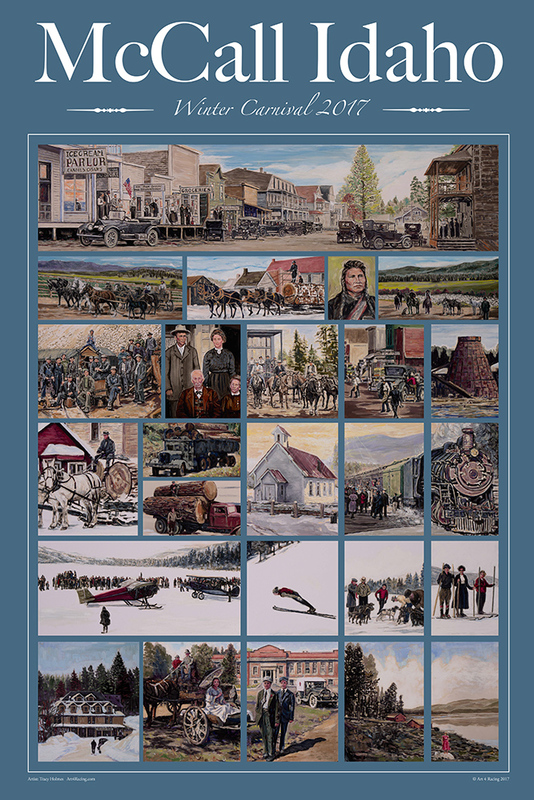 Tracy has created a new poster for the 2017 McCall Idaho Winter Carnival. 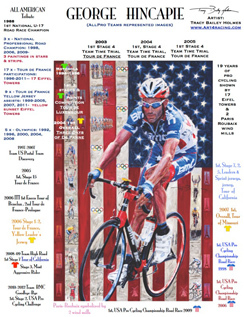 Posters ordered through art4racing.com are signed and cost $10.00 + shipping. To order a signed poster, click here to email us. 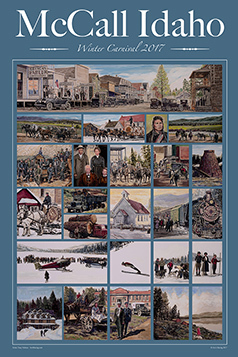 Posters are available in McCall Idaho at the McCall Chamber of Commerce and Visitors Bureau. Click the image at your left for a larger view. Retirement presentation for George Hincapie. 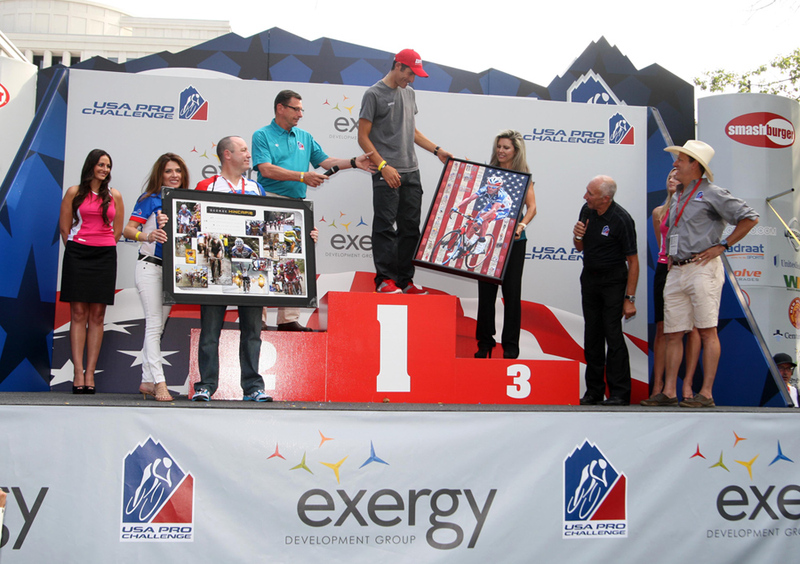 USA Pro Cycling championship 2012. Poster Size: 18" x 24". 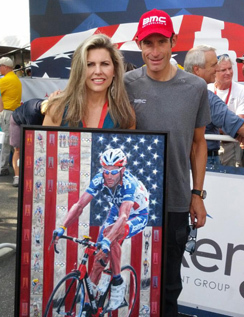 Posters are $20.00 at the Pasadena Marathon event and will be signed and personalized by the artist. 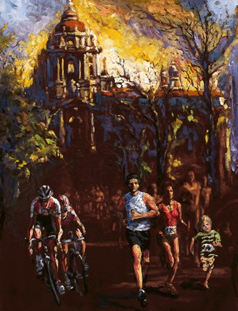 l love running and cycling as both a fan and a participant. 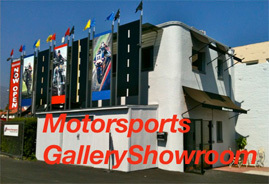 My niche is all Sports Art -- a perfect marriage of my athletic and artistic interests! 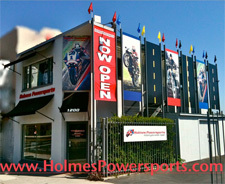 I consider Pasadena my hometown; my husband and I have lived in this city for many years, and our businesses are based here. 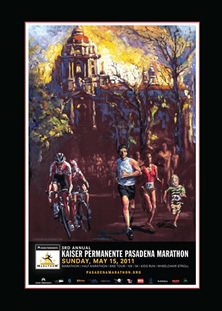 Creating the artwork for the Pasadena Marathon is a dream come true for me! It is such an honor to bring my hometown an image it can proudly own. Good luck, and see you at the Finish! 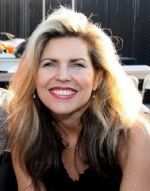 Meet Tracy at her booth at the Pasadena Marathon Expo this Friday (5/13) and Saturday (5/14). 2011 Painting is now available as a limited edition giclee print! The original painting is available as an archival, limited edition, signed and numbered giclee print. Three sizes are available on either paper or canvas. 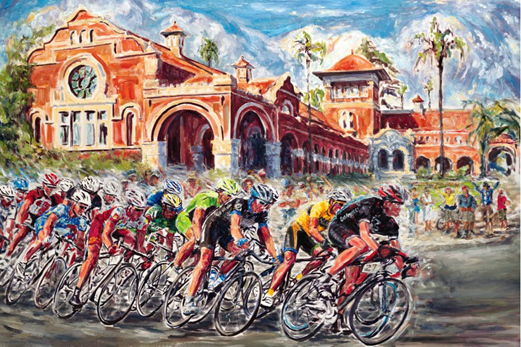 The Redlands Bicycle Classic 2011 Painting is now available as a limited edition giclee print! 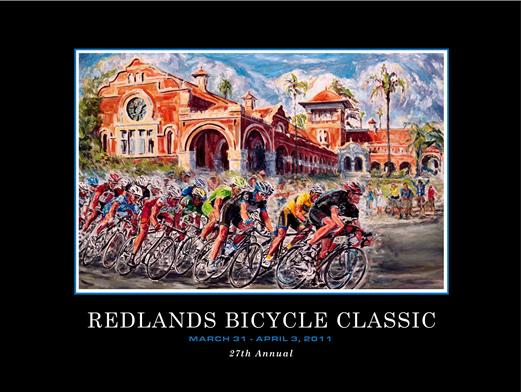 The original painting for the 2011 Redlands Bicycle Classic is available as an archival, limited edition, signed and numbered giclee print. Three sizes are available on either paper or canvas. 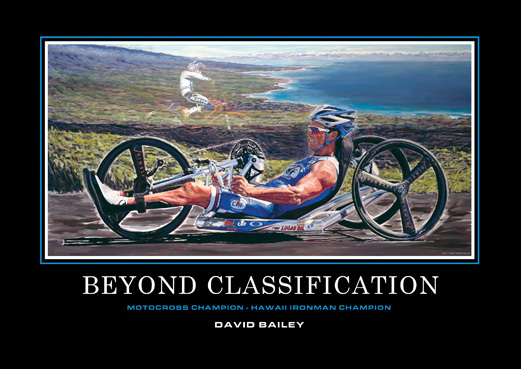 David Bailey poster "Beyond Classification"
Redlands Bicycle Classic "Legend Awardee Hall of Fame & World Ironman David Bailey"
It is a big honor to be a part of this Historical Presentation of the "Legends of an Era" Commemorative Tribute to: Team Discovery, U.S.Postal, Motorola, 7/11, Johan Bruyneel, Tailwind Sports, Steida,Sean Petty,Kevin Livingston, Danny Van Haute, Chan Mcrae, Mark Gorski, Bob Stapleton, Thom Weisel, Jim Ochowicz, owners - US Riders; David Phinney, Andy Hampsten, Ron Kiefel. Frankie andreu, Lance Armstrong, Eric Heiden, Jeff Pierce, Chris Carmichael. 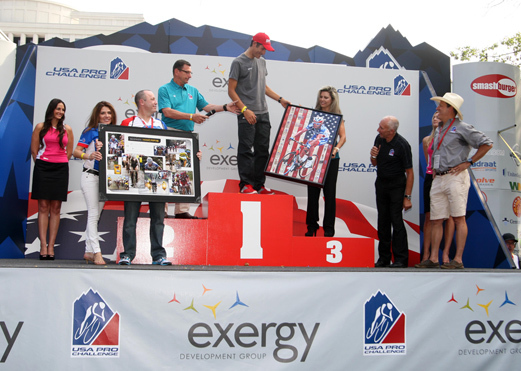 and all those who could not possibly be mentioned, but will not be forgotten for their commitment, pioneering and legendary efforts, in creating the History of American Cycling & Europe! Presented at the Tour of Missouri Sept 16, 2007. Legends of an Era is now available as a limited edition giclee print! Photo: John Pierce PhotoSport International. 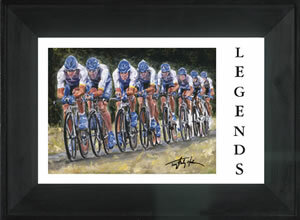 "Legends" Team Time Trial Painting by American Sports Artist: "Tracy Bailey Holmes". 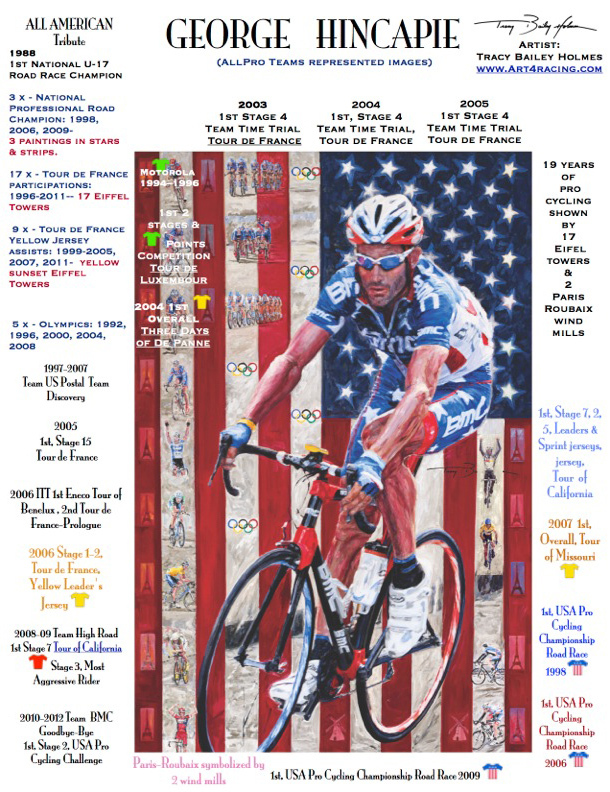 A SPECIAL YEAR END RELEASE of 50 lithographic prints, signed & numbered by the artist, beautifully framed, commemorating the nation's greatest cycling team. A rare and unique gift that will long be remembered. Deadline for x-mas delivery ORDER BY 12/14/07. These will go fast at $95.00 each plus shipping & handling. Please click here for more information and ordering options. Please click here for more information and ordering options.